BELIZE CITY, Wed. Nov. 25, 2015–In July 2012, five employees were terminated from their jobs at Belize Water Services Ltd. At the time of the termination, the management of the government-owned company indicated that the workers were terminated in accordance with the company’s redundancy policy. The workers contended that they were wrongfully terminated and sought redress from the court in a wrongful termination claim. Today, the six workers who sued the company were vindicated when Supreme Court Justice Michelle Arana ruled that they were wrongfully terminated. The claimants in the case are Mark Menzies, Don Gillett, Colin Morrison, Charlette Barnett, Michael Novelo and Journett McKoy. The six former employees who brought the lawsuit against BWS were terminated against the backdrop of a series of salacious letters that were being circulated at BWS. Those letters were written by someone on the BWS staff, and stated that certain managers were involved in unbecoming behavior at the workplace, even sexual activities on the worksite. The BWS launched an investigation in an effort to determine the source of the letters. 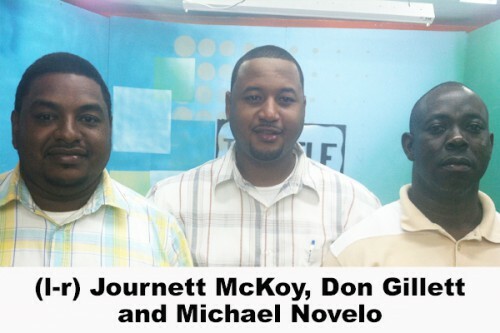 Then on February 6, 2013 all the employees, except one, Journett McKoy, were terminated. McKoy was terminated one week later, on February 14, 2013. On February 7, the day after the employees were terminated, BWS’ Chief Executive Officer, Alvan Haynes, issued a memorandum which stated that the reason for the termination was because of the employees’ refusal to cooperate with the company’s investigation into the letters. In their claim against the company, the employees contended that they were terminated because they did not cooperate with the company’s investigation into the salacious letters floating around the workplace. All of the employees who were terminated were interviewed by the management, some on multiple occasions. In his evidence at the trial, CEO Haynes told the court that the malicious letters circulating at BWS created a suspicious, uncomfortable atmosphere within the company and that the releases of the employees were related to the investigation into the letters. Haynes said he did this in the hope that any employee who had knowledge of the letters would come forward and bring closure to the investigation. Haynes also said that each of the claimants was given a letter from the company stating the reason for his/her termination. Haynes’ memorandum, however was not addressed to the terminated workers, but was for internal circulation. Under sustained cross examination from defence attorney Tricia Pitts-Anderson, Haynes admitted that he had lied in the memorandum to the staff in an effort to boost morale. Another witness for the defense was the Human Resources Manager, Haydon Brown, who testified that the company had begun a phased restructuring since 2009. Brown reiterated Haynes’ statement that the workers were terminated as a result of BWS’s redundancy plan which was carried out through stages, and that the union which represented the workers was informed in writing about each stage. In their defense, BWS, which was represented by attorneys Rodwell Williams, SC, and Julie-Ann Bradley, argued that the company had been in redundancy mode since 2009 and that phased restructuring of its operations was to improve efficiency and cut costs. In rendering her decision, Justice Arana said she was bemused that no less than the union president had come to testify against the workers on behalf of the defendant’s company. Justice Arana said that union leadership is not for the faint of heart. The court has found that the claimants are entitled to damages, but how much damages has not yet been determined by the court. The claimant Mark Menzies was represented by attorney Said Musa, SC of the law firm of Musa and Baldermos, while attorney Tricia Pitts-Anderson of Pitts and Elrington represented Don Gillett, Colin Morrison, Charlette Barnett, Michael Novelo and Journett McKoy.